BOL2030Y Intercom Wall Mount Post 300mm by KELRYAN. The Kelryan Group design and manufacturer swipe card reader posts to suit a range of security and access control applications. Our swipe card reader posts are designed to fit a range of intercom, pin code, swipe card readers and other access control products. 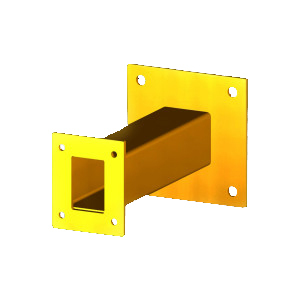 Swipe card reader posts are available in powder coated finishes black or yellow. All swipe card reader posts are available in surface mount configuration only. Description: Intercom Wall Mount Post 300mm – Bolts to wall and allows fitment of BOL2050Y & 2060Y Rain Hood.